Over the years, the price of cloud storage has came down significantly and now, Amazon is making things a whole lot more affordable. 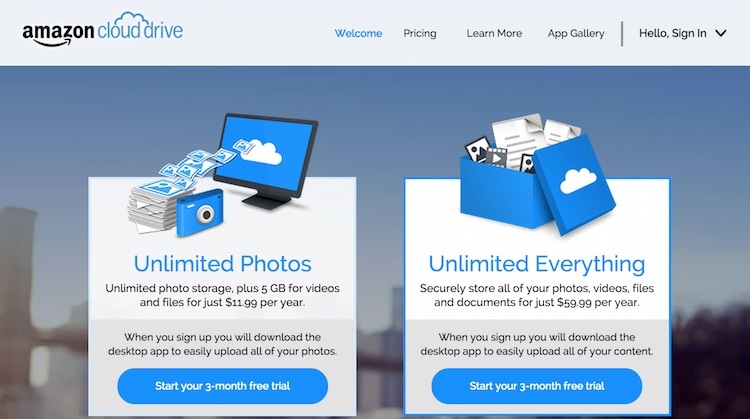 For only US$59.99 a year, the company is offering unlimited storage on its Cloud Drive – that works out to only US$5 a month to store absolutely everything you have on the cloud. For those who want lesser space, pay only US$11.99 a year for unlimited photo storage and 5GB of storage for anything else. These prices are actually very affordable compared to its competitors like Dropbox, iCloud and even Google Drive that offers one of the cheapest rates around. Both storage plans comes with a free 3 months trial so you don’t have to pay right away. Try out the storage plans and see what suites you the most. For those who have plenty of pictures stored across multiple devices, the Unlimited Photo Plan at US$11.99 a year sounds great though, if you have a lot of pictures, 5GB of storage for everything else might not be enough. The new pricing is effective immediately so if you’d like to sign up for it, visit Amazon Cloud Drive for more information. Amazon Cloud Drive is also available on the Amazon Appstore, Apple App Store and Google Play Store.